The Silverburn Shopping Centre is one of the largest and most modern out-of-town shopping centres in Scotland. It opened in2007 and houses many of the biggest names in high-street fashion, jewellery and cosmetics as well as supermarkets and a number of cafes and restaurants. The four major retailers based at the Silverburn Centre are Tesco, Marks & Spencer, Next and Debenhams. The Centre is open 7 days a week with late opening on weekdays to 9pm. The Silverburn Centre is accessible by public transport from central Glasgow and by road, with free private parking for 4,500 cars. For a day, or even two, of shopping all under one roof, the Silverburn Shopping Centre has it all. If you are planning a shopping trip to Glasgow, you won�t do better than The Sandyford Hotel for affordable rooms, a central location between the City Centre and the West End and a warm welcome. Our B&B accommodation is cheap and includes full Scottish breakfast. We are a short drive from the Silverburn Shopping Centre if you are travelling by car and our reception staff will be happy to advise you on how to access Silverburn by public transport, too. 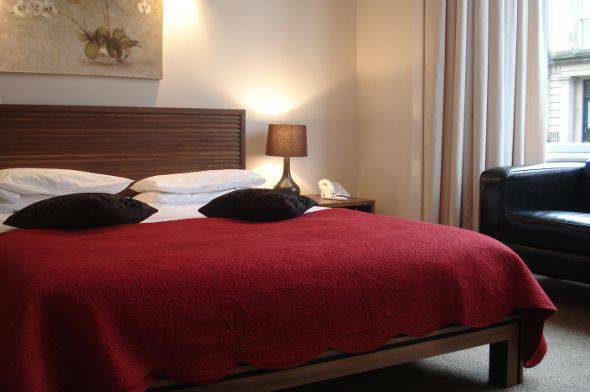 If it�s a weekend away with the girls or a family shopping trip, The Sandyford Hotel offers quality rooms at reasonable prices. To book our bed and breakfast rooms, please call us on (+44) 0141 334 0000. Our friendly reception team is on hand 24 hours a day to answer your queries and advise you on available rooms. You can also make a firm booking through our website, with the help of the reservation form. For a weekend away in Glasgow with shopping at the Siverburn Shopping Centre, The Sandyford Hotel is the perfect choice of accommodation.